Dual-chip platforms (processor + chipset, that is) manufactured these days imply that former Northbridge functions are transferred to processor while chipset handles peripherals. Calling one chip a "chipset" may not seem right already, but we'll stick to the old term. Not all chip manufacturers do the same though: Intel, for example, calls its new Southbridges "Platform Controller Hubs," stressing that it manufactures complete platforms rather than sets of chips. In its turn, AMD names its solutions "Fusion Controller Hubs" (FCH), because "The Future is Fusion!" In fact, today's chipsets are not as different as it may seem. Basic features they perform are similar. As for specific modifications, they may differ a lot within the same lineup, so this isn't something to base comparisons upon. Describing chipsets is somewhat of a thankless task, but it's nevertheless important, because we usually test more than one motherboard from the same family, and there's sense in publishing general information as a separate article. Anyway, today we shall review the second part of AMD's new platform, namely the chipset. Or rather chipsets, because AMD plans to roll out as many as seven products for the Hudson family: three mobile, three desktop, and one enterprise & embedded. Most of these solutions are intended for Llano CPUs (or "APUs" as AMD puts it), which are not yet ready. But Bobcat processors are, as well as A50M, the corresponding lower-end mobile chipset. The general flowchart is the same for all combinations of APUs and different Hudson modifications. Let's compare it with the closest rival — Pine Trail (Atom + NM10) — at least in terms of Northbridge features. Even a quick look indicates that AMD offers a better solution. And it's not only about video features, including more computing power, better functionality, analog and two full-fledged independent digital outputs. Also, unlike Pine Trail-based laptops, most Brazos-based ones will have an additional HDMI output, and nettops will support multiple monitors as a regular feature. PCIe controllers differ too. The current Atom only supports four PCIe 1.1 lanes used for the DMI interface (an electrically-modified PCIe x4) that connects Southbridge. 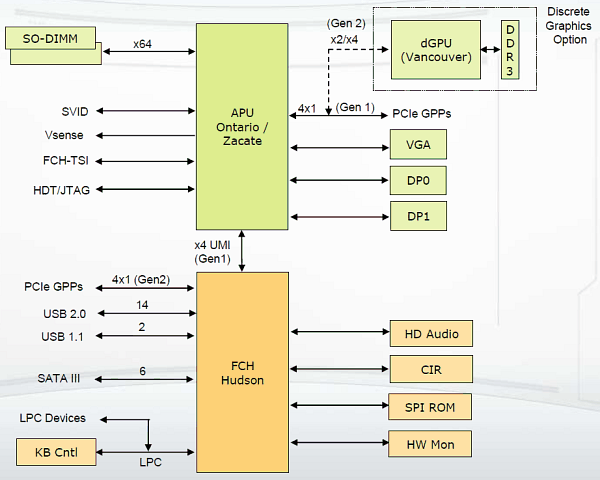 In turn, AMD's APUs support eight PCIe lanes: four (also PCIe 1.1) are also required to connect Southbridge, and the other four can be used to connect external graphics cards or other controllers. Well, of course, PCIe x4 is four times slower than PCIe õ16, but Intel doesn't have even that. Ironically, Atom needs discrete graphics more, so engineers have to take technically dubious measures. For example, NVIDIA Ion2 has video chip connected by a PCIe x1 lane via Southbridge. (Although its graphics is a mobile and quite low-powerful solution capable of accelerating HD video but not much else, so it's not a problem in that case.) But anything more powerful is out of the question. Brazos-based systems, in turn, can offer more. Question is whether they really need that discrete graphics. But we'll try to answer that a bit later in our tests. High Definition Audio 7.1 vs. the same. A few conclusions can be drawn from the specifications above. Firstly, there are more features then one may really need (maybe in the future). What a mobile PC might need six SATA ports for? Even if we assume that the platform will be used not only for netbooks and nettops, it still seems like too much. As you might remember, currently there's a 1Gbps processor interconnect, while everything that Southbridge can handle would require about 7Gbps in total. Luckly, hardly anybody will use all those peripherals at the same time. The interconnect will get faster in future chipset versions, but those will be aimed at different processors already. Secondly, there's considerable imbalance between purpose and specifications. Yes, sure, A50M is more advanced than NM10, but a lot of features it has won't be used. It has too much for a nettop, but doesn't have enough for a desktop. The platform would seem a great NAS solution thanks to so many SATA ports, but there's no RAID support and only 100Mbps Ethernet. It could be a great HTPC platform thanks to good graphics features, but there's that 100Mbps Ethernet again and no USB 3.0 support (which is becoming widely accepted). As of now, both problems can be solved by using auxillary controllers and that will result in hight prices. Once again, changes have been slated to the next series that will have Gigabit Ethernet, RAID (at least 0, 1) and even built-in USB 3.0 (Hudson chipsets will seemingly be the first to have it). But that's a matter of the future, not the present. Thirdly, what about power consumption and price? Right now things are not looking good enough: the 65nm chipset is encased into a 605-pin BGA housing sized 23x23 mm and has 4-watt TDP. In turn, NM10, despite older process technology, is just 17x17 mm large (hence lower cost price) and has 2.1-watt TDP. The advanced Northbridge part has drawbacks as well: Zacate chips have 18-watt TDP, while the noticeably slower Ontario have 9-watt TDP. Dual-core Atom processors look better from this angle: mobile N550 — 8.5 W, desktop D525 — 13 W. I.e. even the latter, combined with NM10, is comparable with Ontario + M1. That's why AMD plans that Zacate will compete not with Atom-based netbooks, but with lower-end notebooks based on mobile Pentiums and Celerons. Whether such competition will be successful, only time will tell. It's not easy to beat, say, Pentium U5600 + H55M, if prices for ready products are similar. But it's too early to talk about this now. AMD A50M (Hudson M1) chipset leaves an ambiguous impression: if it's a mobile (or an ultramobile) solution, why does it need 6 SATA ports? If it's something more advanced, why is it inferior to company's modern Southbridges? Seems like a result of trade-offs, power consumption included. As if AMD was developing something else — for Llano — having forgotten about the Bobcat series. When it was time to release Bobcats into the market, AMD took what was available and without noticeable changes (simplification would've been reasonable) annouced that a part of its new platform. On the other hand, there are currently no alternatives to A50M, so its popularity (or unpopularity) will solely depend on how well processors will sell.